More important to us now is the spread of true concept of Imam Mehdi. 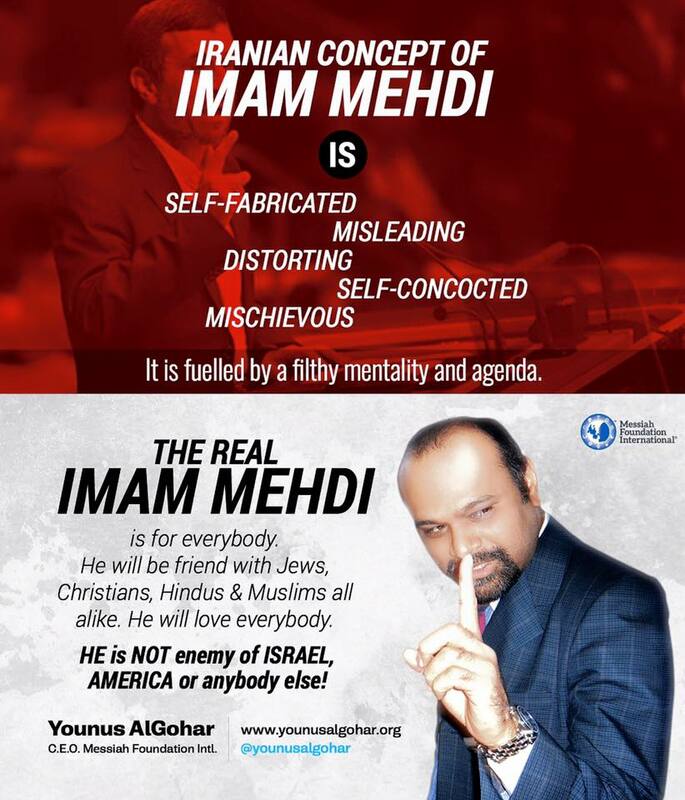 Firstly, what is the truth in our explanation and concept of Imam Mehdi? What is wrong with the Iranian and Sunni concepts of Imam Mehdi? Why should people believe in the concept of Imam Mehdi that we are presenting to the world? We will have to go through a number of things before we can possibly convince people to believe what we are saying. The most important thing is the source. Humanity is waiting for a Universal Redeemer, Universal Saviour, Universal Unifier. Every celestial religion has given that Universal Redeemer and Saviour a particular title. This title does not mean that the Universal Saviour – who, according to the divine plan, will come to this world towards the end times – is many personalities, not one. God has initially given concrete, solid hope to people who will live in the end times. Humanity has been living in this sphere of the world for many million years. The early part of life in this world was not spiritually, theologically or religiously so enriched or advanced. Only 6000 years ago when the last of all Adams was sent, for the first time in human history, God allowed human beings to develop a more personal, exclusive and intimate relationship with him. This Adam (known as Adam Safi Allah) was given mystical and spiritual knowledge. Before this Adam, spiritual knowledge was not granted to any of the many thousand different types of offspring of different Adams. In the pre-Adam Safi Allah era, since no spiritual knowledge was granted to human beings, none of them was able to be in contact with God. Before the arrival of Adam Safi Allah, God was completely cut off from human beings. No human being was in contact with God; no direct or indirect contact was possible to be made. Every human being had and has souls and spirits. The knowledge of the soul – which could enable them to worship God with the soul and spirit and be in contact with God – was not granted to them. The last of the series of Adams, Adam Safi Allah, was granted knowledge of spirituality. Then, more than 100 000 prophets were sent. The last prophet of all was sent into this world almost 1440 years ago. Since then, humanity has not been blessed with the presence of any messenger or prophet from God. As a result, the glory of religions which were established by God-sent prophets and messengers started to fade away. The life of those religions started to weaken; a time came when they became spiritually redundant. People were unable to use these religions to reach God. Of course, there are thousands of practitioners of these religions today. Muslims, Jews, Christians, Hindus, Sikhs and all sorts of people are worshipping God every day in their respective worship places all around the world. However, the purpose of these religions has completely been lost. Man is not quitting his old habit of bloodshed and hatred. How do we believe people who practise religion today have made any use of the religious knowledge when they are still stuck with their diabolical nature of holding grudges against each other, shedding blood and promoting hatred? Even with the enormous amount of worship they carry out each day, they do not seem to benefit from the practice of their religions, which clearly indicates that religions have lost their glory and spiritual mediumship. What they wanted to achieve through practice of religion is not to be attained. We have seen dedicated worshipers. If worship could have gotten them anything in terms of a good character or turning these individuals into nice and kind characters, they would have done it. However, the worship is not affecting them. Out of millions of years, these last 6000 years are a very rare patch of time in which the spiritual knowledge was introduced. It has been almost 6000 years now, but the last prophet came almost 1500 years ago. The time spent in which the knowledge of spirituality was introduced and done and dusted is 4500 years. There has not been a prophet or messenger in the last 15 centuries. This is the reason why God had a plan of sending a Universal Redeemer. 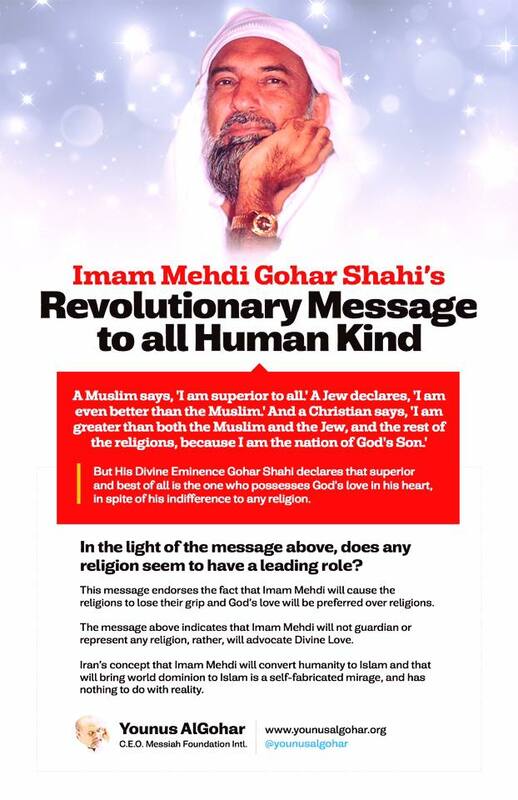 Some people say, ‘We have a Messiah,’ others say, ‘Imam Mehdi is for Islam only,’ and some others say, ‘Kalki Avatar is for Hindus and Kalkidaan is for Sikhism only.’ God has run out of messengers and prophets. Very scarcely, he has come with an idea of a Universal Redeemer and Saviour who will come and unite everybody, who will serve everybody and connect everybody to God. God has nothing to do with your body. Your body was created in the womb of your mother, God didn’t see it and will not see it. When you die, your body will be cremated or buried. When God sends his message, he sends it to correct and purify your soul – to enable your soul to worship him. There are only five spirits in a human breast and there have already been five Grand Messengers, who introduced five different types of knowledge. Five Grand Messengers have been sent; knowledge relating to these five spirits has already been introduced, adulterated, modified and forgotten. That knowledge is becoming extinct now. Nobody knows what the teachings of Adam, Abraham, Moses, Jesus or Mohammad were. It’s all done and dusted. What people know today as Islam is slashing throats of people, going to mosques, standing there for a few minutes in Salat, eat halal meat and have four wives. The knowledge of Prophet Mohammad is long forgotten. There is not another soul in the human breast which is needy of any knowledge; all the knowledge has been sent. That is what God planned. God is absolute power, but if God wanted to send another messenger, he must have planned it earlier. Now, he can’t do it. Not even one messenger or prophet can be sent by God now, because when prophets and messengers come from God, they bring knowledge from God. When you assembled before God, it was not your body, but your soul. If you will ever be in contact with God, it will happen through your soul, not through your body – because God is not aware of your body. Now people are falling out on the issue of the Awaited One! It’s as if [religious people are] kids, not adults. There is only one playground and all the kids have to play in it. If Christians say, ‘We want a Christian playground,’ and Muslims say, ‘We want a Muslim playground,’ it doesn’t work like that. All Christians, Hindus, Jews, Muslims have to play in the same playground. People demand a different Redeemer and Saviour from God. They seem to want God to allot a Redeemer with the same authority and power into each religion. If God was that generous, he wouldn’t have stopped sending prophets and messengers. ⁃God sent 5 Grand Messengers. Each of them was given esoteric knowledge. One half of that esoteric knowledge was kept for the prophet, and the other half for the saints. Therefore, there are a total of 10 parts of esoteric knowledge. From the esoteric knowledge given to the prophets, they would give blessings and they would grant salvation. Whoever obtained esoteric knowledge adopted the esoteric customs of their prophet. ⁃There was one type of knowledge which God did not even grant to his beloved: the knowledge of Ishq (Rapturous Love). ⁃Faqr is due to Tifle Noori. Ishq has to do with Jussa Tawfiq-e-Ilahi. Prophet Mohammad had both the Tifle Noori and Jussa Tawfiq-e-Ilahi, however the Tifle Noori was dominant on him. ⁃Lal Shahbaz Qalandar was given Jussa-e-Tawfiq-e-Ilahi that was Zaati (to do with God’s Essence). In the esoteric realm, there are two types of Jussa-e-Tawfiq-e-Ilahi: One is the lion without wings and the other is a lion with wings, which can fly. The Jussa-e-Tawfiq-e-Ilahi granted to him was one that could fly. Among all creation, he was the only one given such a Jussa-e-Tawfiq-e-Ilahi. ⁃Faqr = servitude. It means to empty yourself of you and fill yourself with God. Ishq = kingship. ⁃In Imam Mehdi, there is the original Tifle Noori which God saw and then danced. When God danced, then the other seven Tifle Nooris came into existence. The Jussa Tawfiq-e-Ilahi in Imam Mehdi is the greatest, ancient manifestation [of God]. It is one that is able to fly. ⁃Because of his Jussa Tawfiq-e-Ilahi, Lal Shahbaz Qalandar was unable to be in the state of being spiritually and physically sober. That Jussa Tawfiq-e-Ilahi is nothing in comparison to the one given to Imam Mehdi. ⁃Imam Mehdi is going to show the world what Ishq really is. He will show the world Ishq that the world has never witnessed before. Younus AlGohar compares the lifestyles prescribed by God in religions and the lifestyle adopted by non-religious people in modern society. Younus AlGohar establishes how Islam is dead without spiritual knowledge and how essential spiritual knowledge is. He also explains why and how Sharia is mischief without spirituality. In Islam and Judaism, those who talked about spirituality were always condemned and disapproved of by the mainstream religion. Sufism (spirituality) had been the centre of Islamic teachings until 200 years ago. Wahhabis were the pioneers of rejecting Sufism, calling it unIslamic – although there have been Sufis all over the world. Quran says that worshippers who are naive to the truth of worship are destructed. Their worship is not reaching God; rather, they’re showing off. It doesn’t mean physical destruction, but destruction of faith and character. What does showing off mean? Their worship will not reach God, but people think they are dedicated worshippers. When this happens, people’s respect for such a person boosts their ego, destroying them spiritually. Such a person becomes a live threat to moral values in society. That’s how Sharia becomes mischief. Truth of worship would have entered your heart only if you practised spirituality. Spirituality enlightens hearts, manifesting truth on the screen of the heart. Since people don’t practise spirituality among Muslims, therefore their Salat (worship) is futile, useless and not recognised by God. Sharia is only good with spirituality which will control your heart and you won’t make wrong decisions. Spirituality makes you compassionate. Without spirituality, your heart will be as hard as stone and with spirituality, the heart will be soft. You will help all regardless of religion. However, Sharia without spirituality (now or even at the time of Prophet Mohammad), was, is and will remain to be mischief forever. Younus AlGohar responds to book tweeted to him called ‘Ceasefire! Religions and the Way to God Controversy’. He explains to metaphorical and hypothetical understandings about the phrase ‘Way to God’ and why spirituality is essential to reaching God. Some people rigidly refuse to believe in God and attack those who believe in God. What’s the difference between them and promoters of extremism? The attitude and policy, that of ‘My way or the highway,’ leads one to become a social extremist. Tolerance is the basic element of a free society. Currently, religions and the way to God are two different things. Religions don’t direct people to God, rather direct them to believing in God. Only mysticism directs people to God. The hypothetical meaning of ‘Way to God’: you are covering a distance between you and God, and finding union with him. You know where he is. The metaphorical meaning of ‘Way to God’: To think about God, become obedient to God, uphold the divine law and live life according to it. In this practice, your character won’t change and you won’t become divine. When religions were in their purest form, reaching God was difficult. The results of practising the religion are not seen instantly, but rather on the Day of Judgement when God will summon all the souls to hold them accountable for their deeds in the phenomenal world. In spirituality, one gets the reward instantly in form of God’s nearness and love. Lord Ra Riaz says, ‘Neither is God far from you nor is he close to you. He is within you. Explore yourself; he is beyond the veil of You.’ With the help of spirituality, whoever becomes divine and unified with God is better than all others, regardless of their gender or sexuality.